A member of the JewishGen Board of Governors, Sarina Roffé has more than two decades of experience and a passion for Sephardic genealogy. Born into Brooklyn’s Syrian community, Sarina realized the importance of chronicling her family’s history after the death of her grandparents in the late 80s. With 52 first cousins, it became easy to lose track of who was related to whom. Documenting the family history along with historic family photos gave Sarina’s family a written record that could be passed down through the generations. Over the years, the family tree became more and more valuable as the family grew and needed a resource for their children. The family genealogies Sarina created became the ‘go to’ source for hundreds of people in her family. Rabbis use her family trees as a primary source of information. As the designated family historian, Sarina soon became frustrated that public records were not easily available from Aleppo, Syria where her family originated. So Sarina founded the Sephardic Heritage Project (link) to identify brit milah, marriage and death records from the former Ottoman Empire (which includes Syria) available for genealogical research. Sarina has completed genealogies for the following community families: Missry, Salem, Shaalo, Labaton, Hedaya, Seruya, Beda, and Kassin. 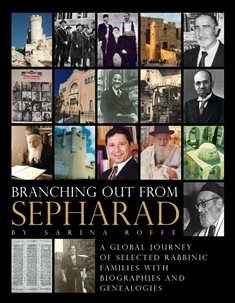 In 2002, Sarina completed Branching Out, the genealogy of Chief Rabbi Jacob Kassin z’l, which traced his lineage as a descendant in an unbroken chain of rabbis to 1492. In addition, she completed two family trees for the Roffé and Wahnish families of Morocco. A Distinguished Toastmaster Sarina has presented at numerous conferences including the World Congress of Jewish History and the International Jewish Genealogical Society. She is a frequent contributor to genealogical publications, encyclopedias, journals and magazines. She holds a BA in journalism from the University of Maryland and an MA in Jewish Studies from Touro College.